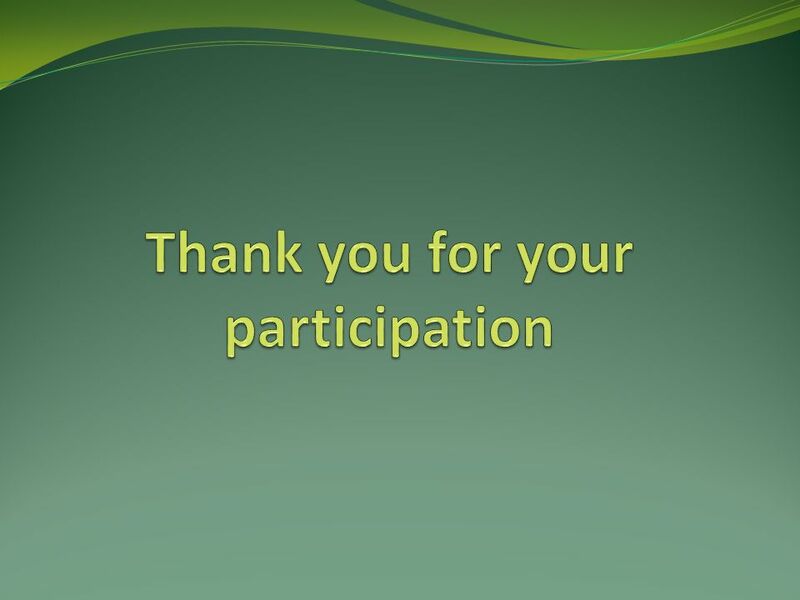 Webinar recording will be available + slide deck All attendees will be muted Please use question + chat feature Q&A session Thank you for joining us. Sandra Robinson will be moderating the webinar. The webinar is being recorded and will be sent out to and posted online on the CMAF website along with the PowerPoint slides All attendees will be on mute during the entire webinar. For any questions and/or concerns, please use either the question box or chat features and staff will respond accordingly. 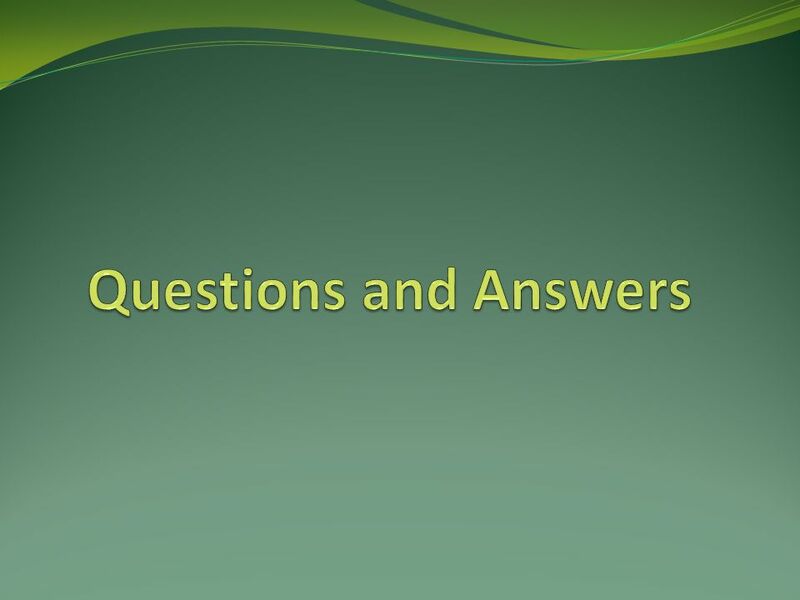 We will have a Q&A session during the last 15 minutes of the webinar to answer any questions. 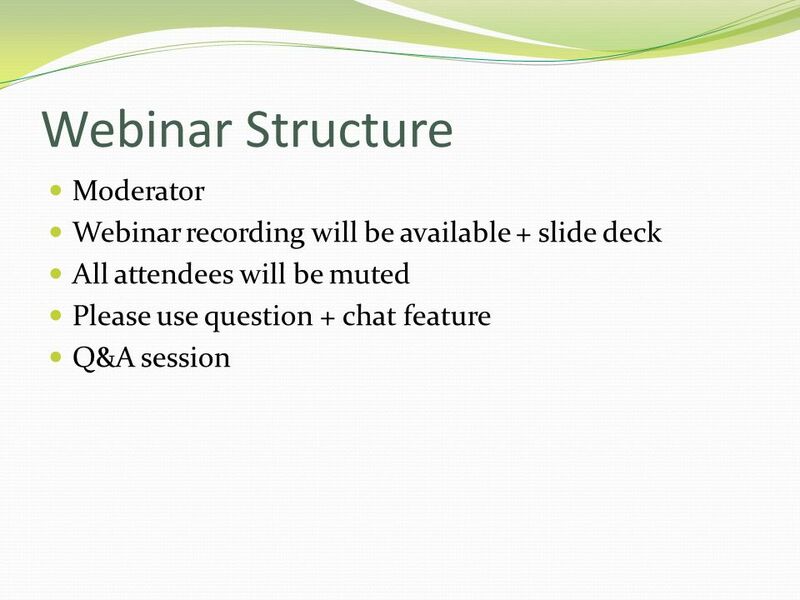 Attendees are encouraged to send their questions anytime during the webinar are they pop up. They will get addressed during the Q&A session. 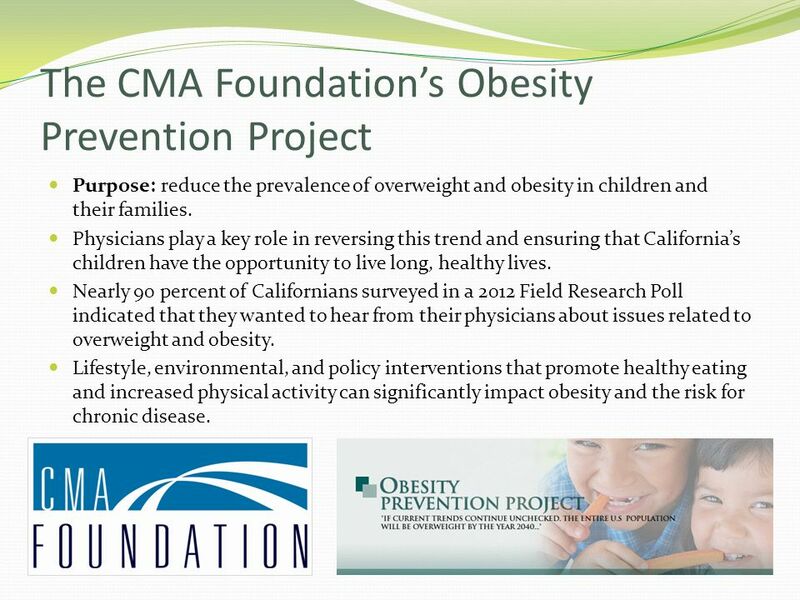 Purpose: reduce the prevalence of overweight and obesity in children and their families. Physicians play a key role in reversing this trend and ensuring that California’s children have the opportunity to live long, healthy lives. Nearly 90 percent of Californians surveyed in a 2012 Field Research Poll indicated that they wanted to hear from their physicians about issues related to overweight and obesity. Lifestyle, environmental, and policy interventions that promote healthy eating and increased physical activity can significantly impact obesity and the risk for chronic disease. 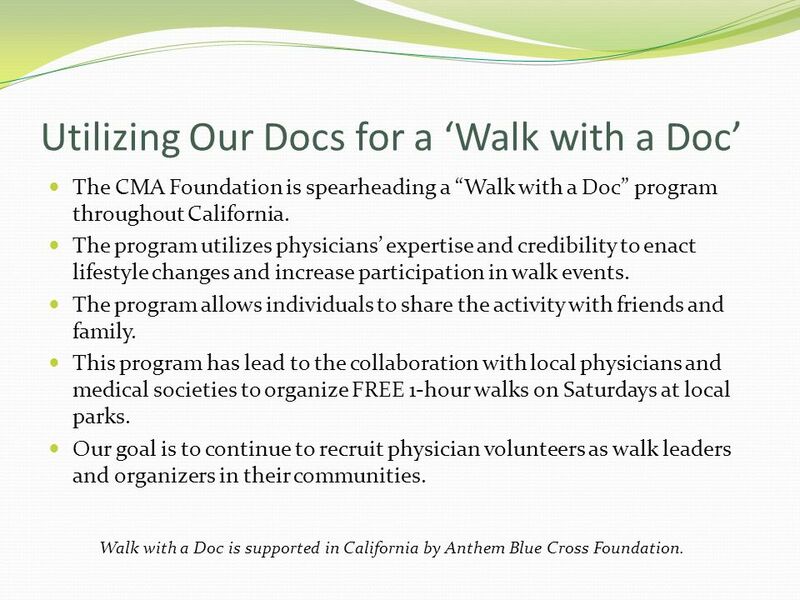 The CMA Foundation is spearheading a “Walk with a Doc” program throughout California. 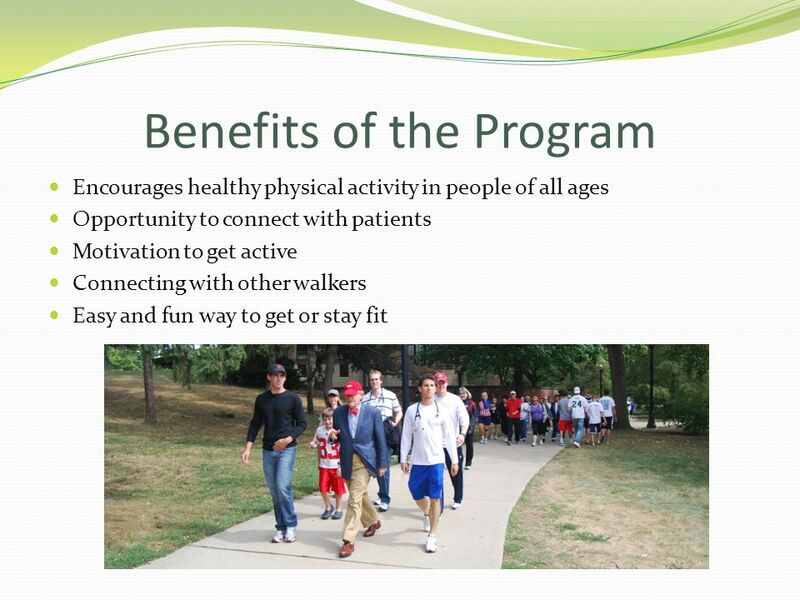 The program utilizes physicians’ expertise and credibility to enact lifestyle changes and increase participation in walk events. The program allows individuals to share the activity with friends and family. This program has lead to the collaboration with local physicians and medical societies to organize FREE 1-hour walks on Saturdays at local parks. 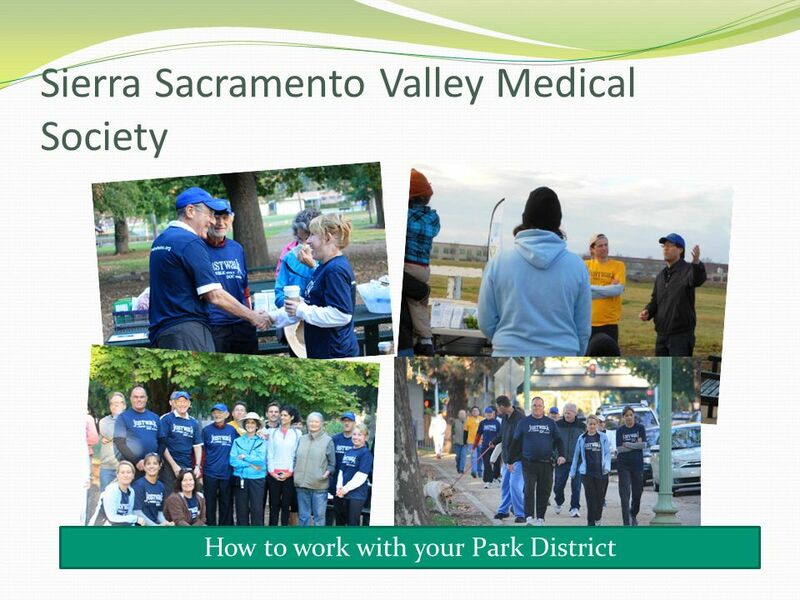 Our goal is to continue to recruit physician volunteers as walk leaders and organizers in their communities. 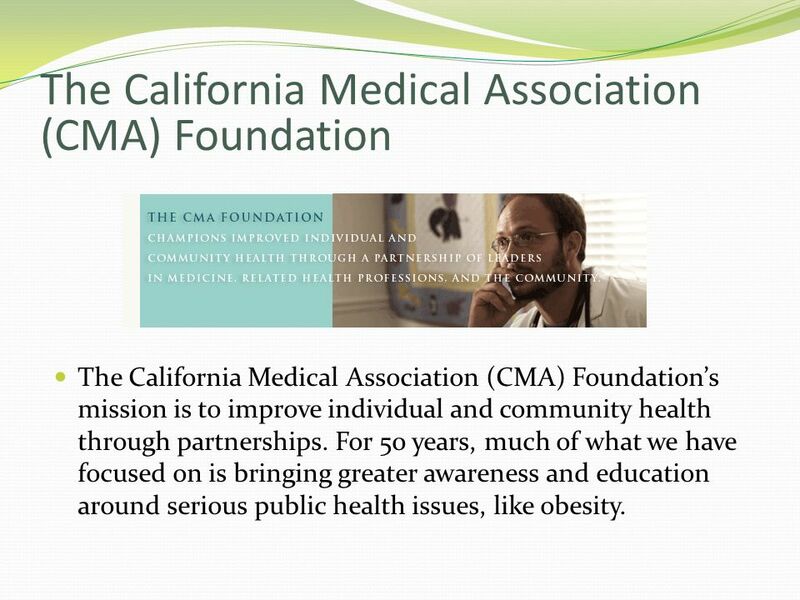 LAST SLIDE FOR CAROL As part of the CMA Foundation’s mission to improve individual and community health, we are spearheading a “Walk with a Doc” program throughout California. 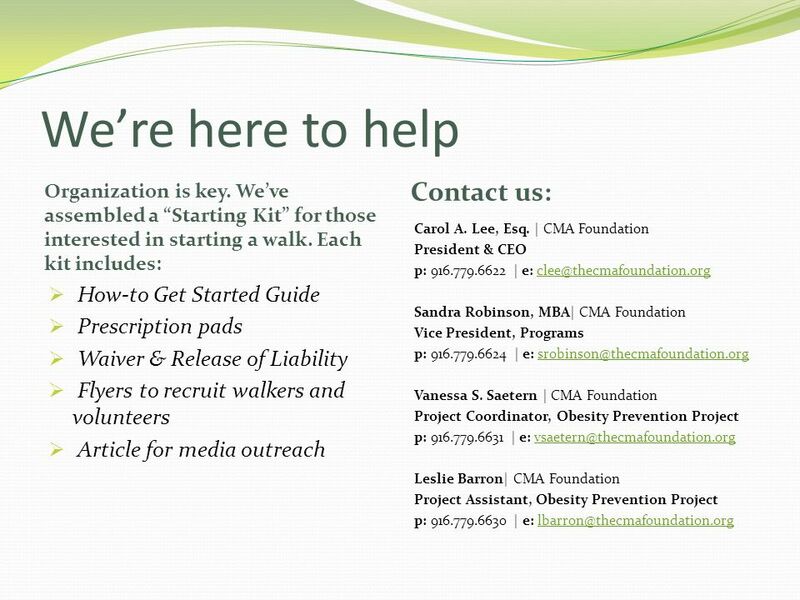 The CMA Foundation’s Walk with a Doc program utilizes physicians’ expertise and credibility to enact lifestyle changes. 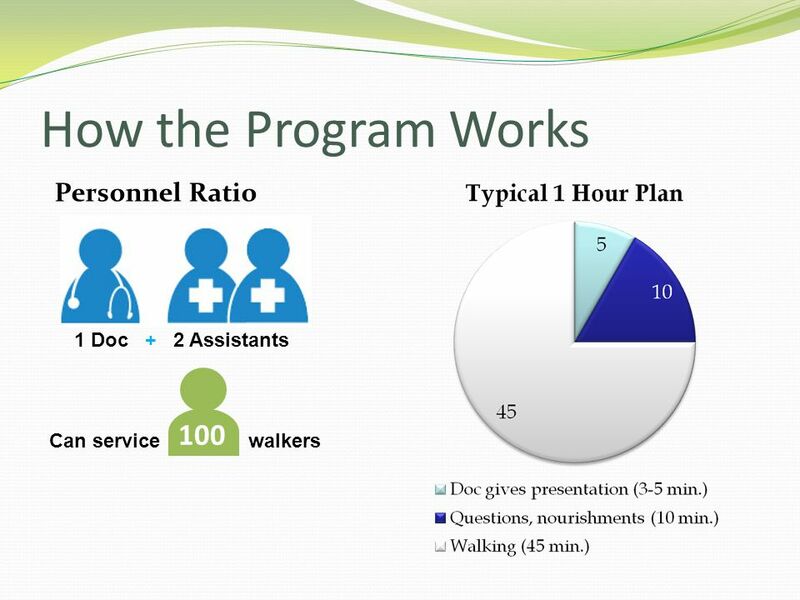 Promoting physician led walks will also serve as a way to increase participation, as physicians are viewed as credible leaders in these efforts. Walk with a Doc will provide the opportunity to engage in a program that allows individuals to share the activity with friends and family, offering a built in support system. This program has lead to the collaboration with local physicians and medical societies to organize FREE 1-hour walks on Saturdays at local parks. 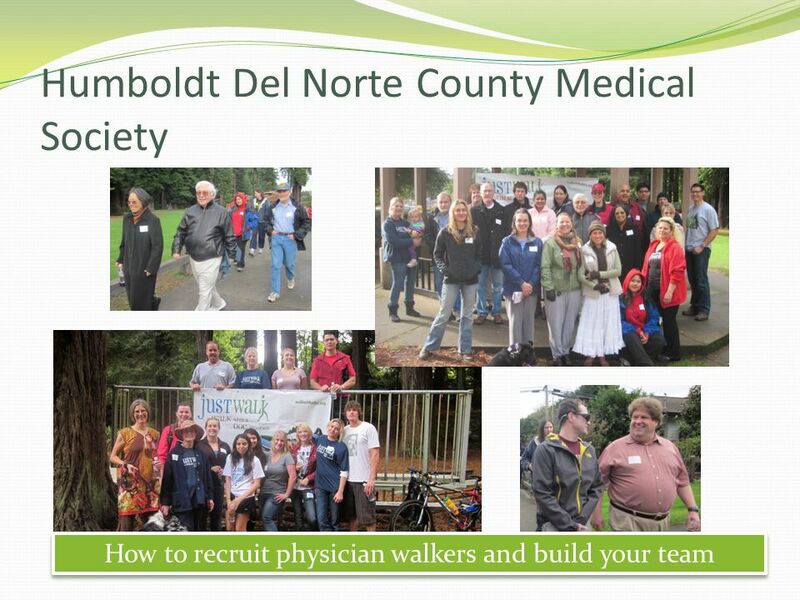 Our goal is to continue to recruit physician volunteers as walk leaders and organizers in their communities. 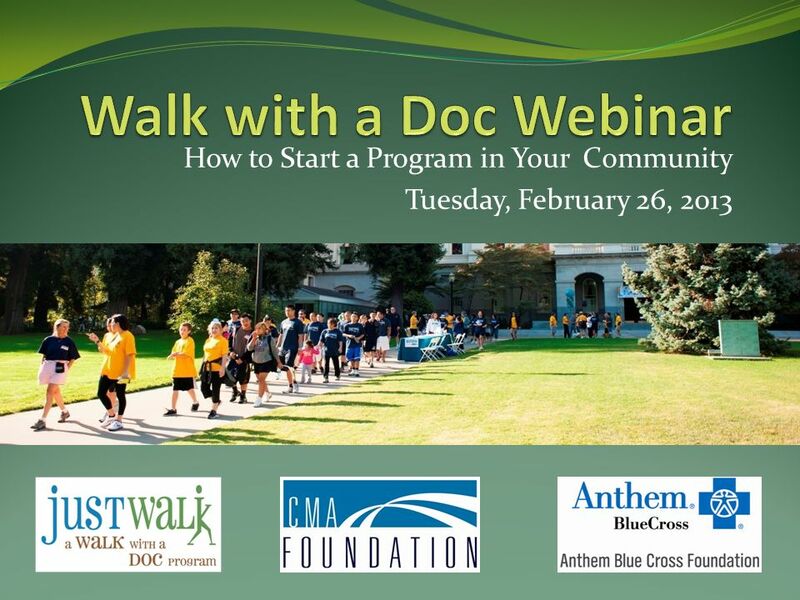 Walk with a Doc is supported in California by a grant from the Anthem Blue Cross Foundation. 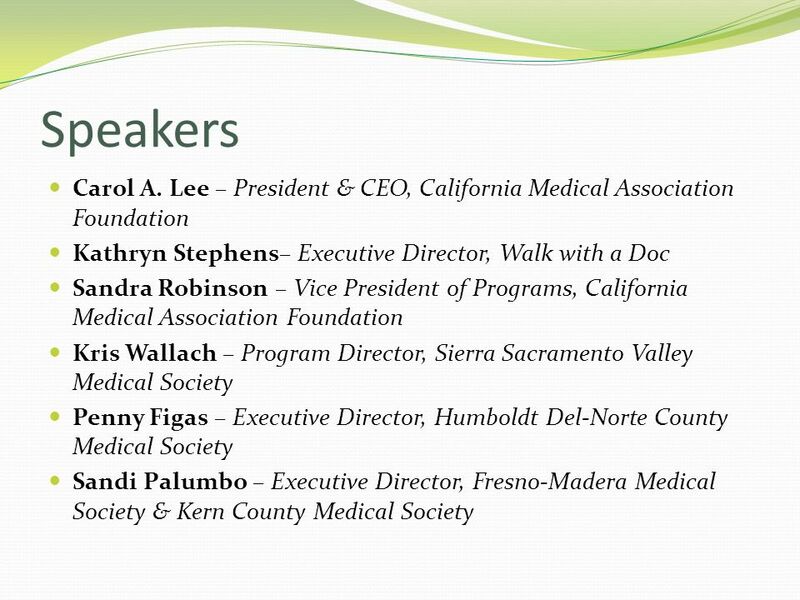 CAROL to introduce KATHRYN STEPHENS Walk with a Doc is supported in California by Anthem Blue Cross Foundation. 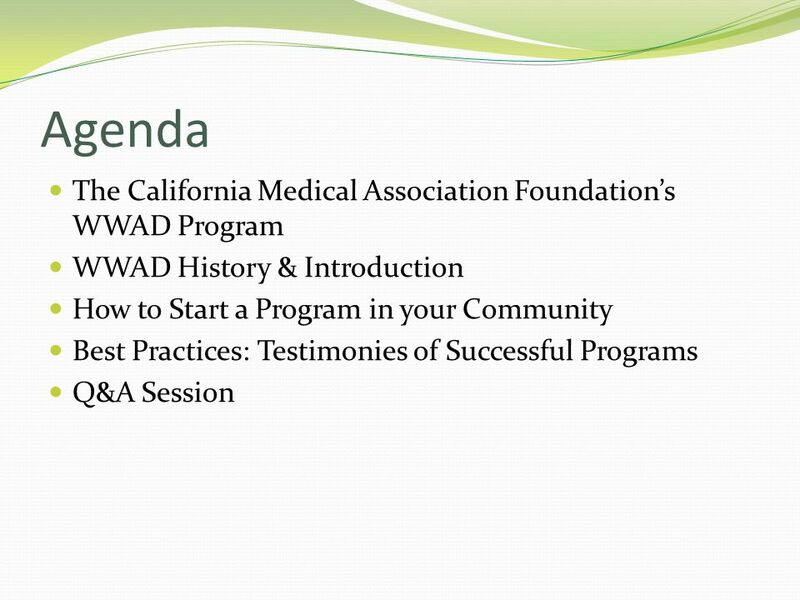 9 What is the WWAD Program? Created by Dr. David Sabgir, a board-certified cardiologist who practices in Ohio. 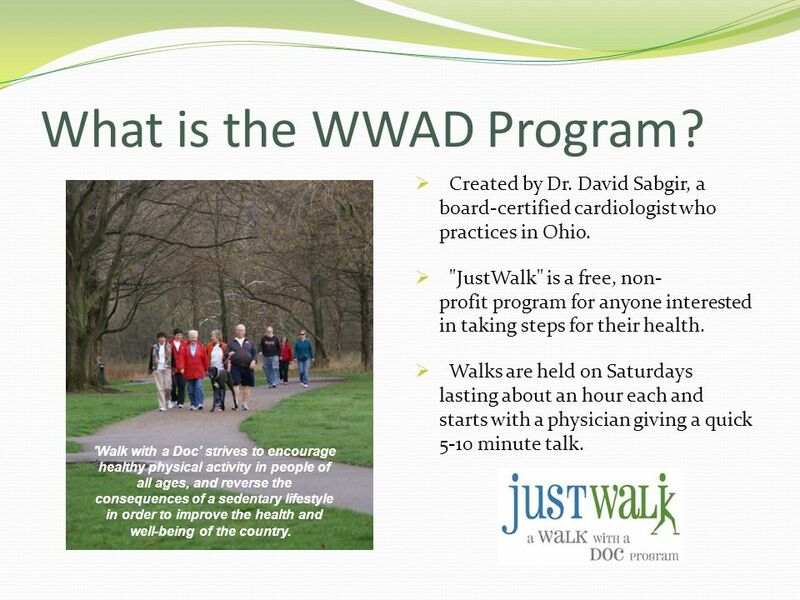 "JustWalk" is a free, non-profit program for anyone interested in taking steps for their health. 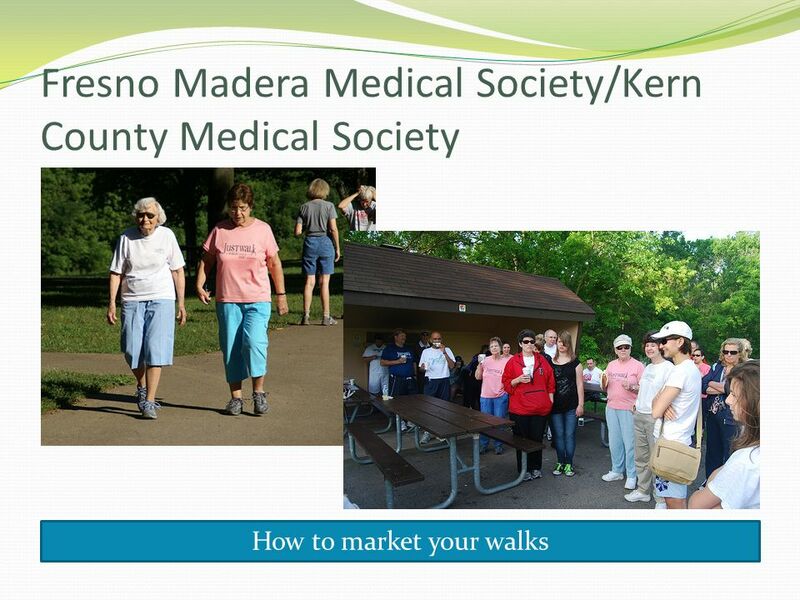 Walks are held on Saturdays lasting about an hour each and starts with a physician giving a quick 5-10 minute talk. Created to encourage healthy physical activity in people of all ages and reverse the consequences of a sedentary lifestyle in order to improve the health and well being of the country. 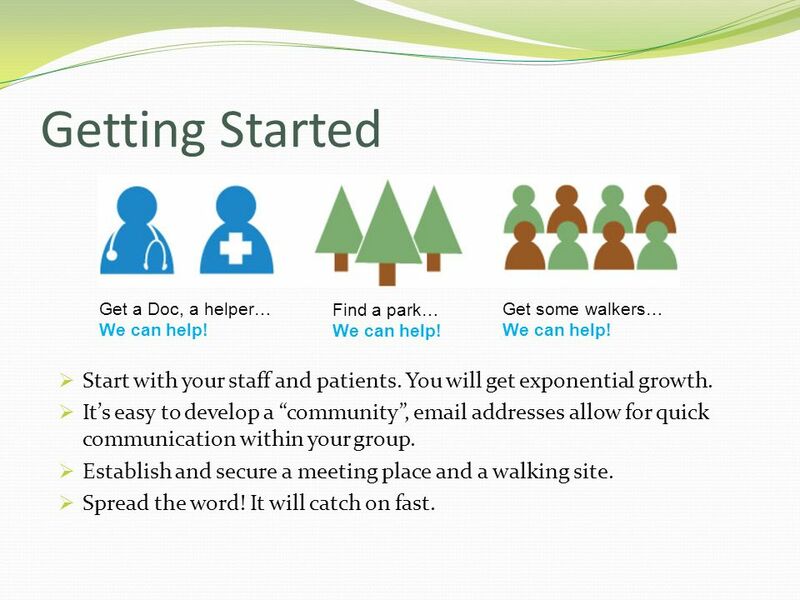 We started this program because it was an opportunity for us to connect with patients and hopefully, for walkers to have the motivation to come out and join us for minutes. Learning about healthy lifestyle options and connecting with other walkers is an easy and fun way to get or stay fit. 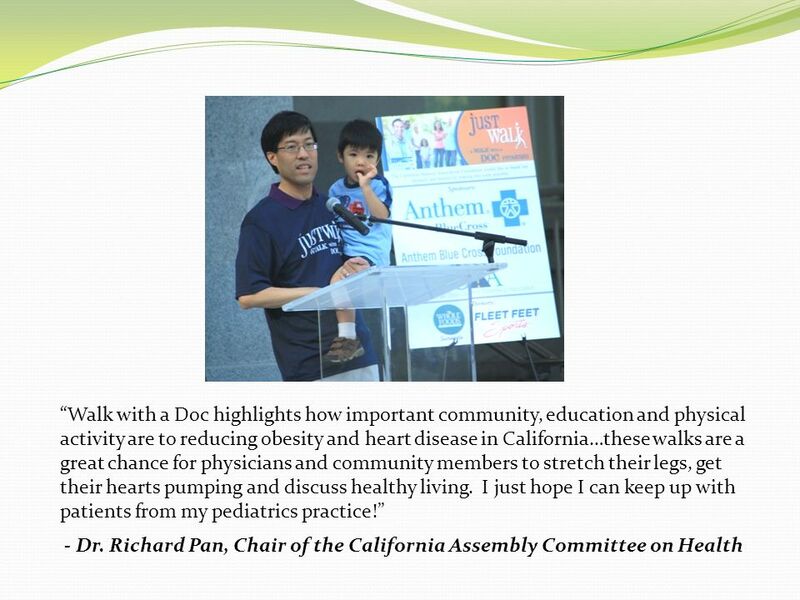 'Walk with a Doc’ strives to encourage healthy physical activity in people of all ages, and reverse the consequences of a sedentary lifestyle in order to improve the health and well-being of the country. 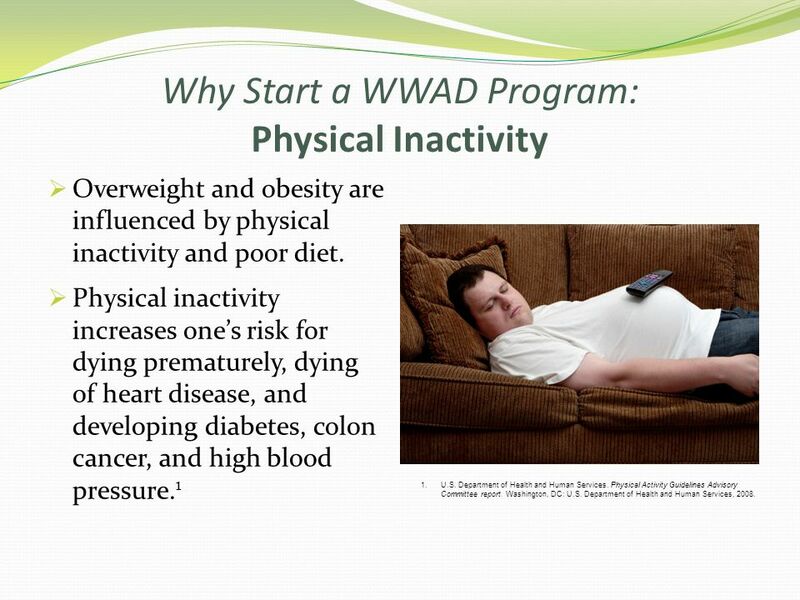 Overweight and obesity are influenced by physical inactivity and poor diet. Physical inactivity increases one’s risk for dying prematurely, dying of heart disease, and developing diabetes, colon cancer, and high blood pressure.1 U.S. Department of Health and Human Services. Physical Activity Guidelines Advisory Committee report. Washington, DC: U.S. Department of Health and Human Services, 2008. Adults Children Children generally walk much less than they did a decade ago. 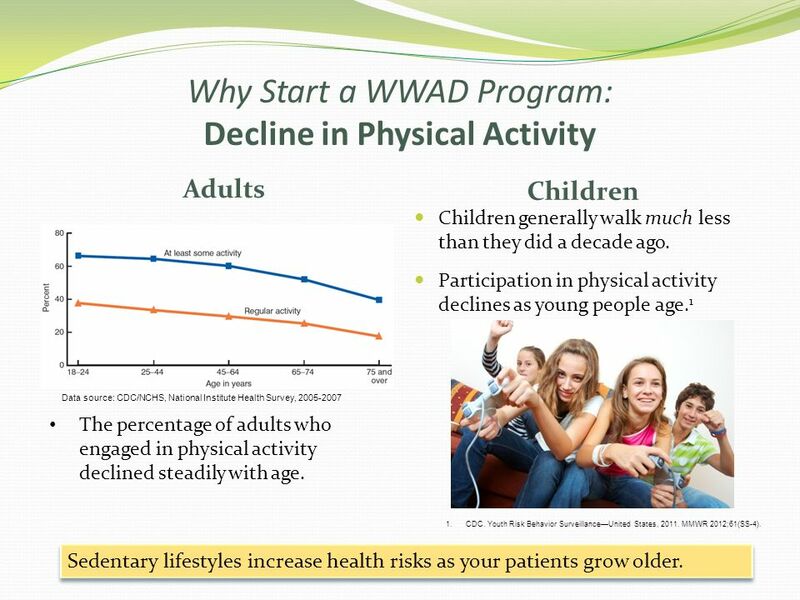 Participation in physical activity declines as young people age.1 Data source: CDC/NCHS, National Institute Health Survey, The percentage of adults who engaged in physical activity declined steadily with age. CDC. Youth Risk Behavior Surveillance—United States, MMWR 2012;61(SS-4). Sedentary lifestyles increase health risks as your patients grow older. 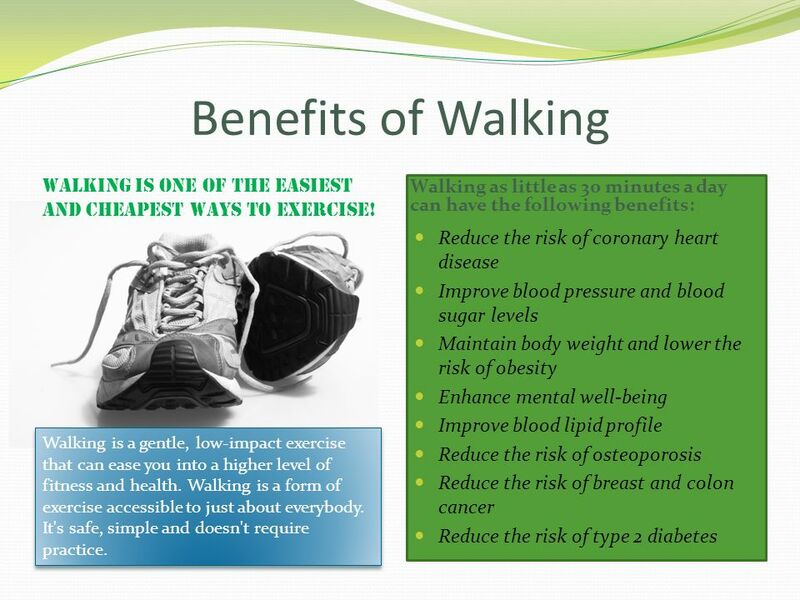 12 Benefits of Walking Walking is one of the easiest and cheapest ways to exercise! Walking as little as 30 minutes a day can have the following benefits: Reduce the risk of coronary heart disease Improve blood pressure and blood sugar levels Maintain body weight and lower the risk of obesity Enhance mental well-being Improve blood lipid profile Reduce the risk of osteoporosis Reduce the risk of breast and colon cancer Reduce the risk of type 2 diabetes Walking offers countless health benefits and of course helps reduce a person’s risk factors for heart disease Walking is a gentle, low-impact exercise that can ease you into a higher level of fitness and health. Walking is a form of exercise accessible to just about everybody. It's safe, simple and doesn't require practice. Encourages healthy physical activity in people of all ages Opportunity to connect with patients Motivation to get active Connecting with other walkers Easy and fun way to get or stay fit Created to encourage healthy physical activity in people of all ages and reverse the consequences of a sedentary lifestyle in order to improve the health and well being of the country. 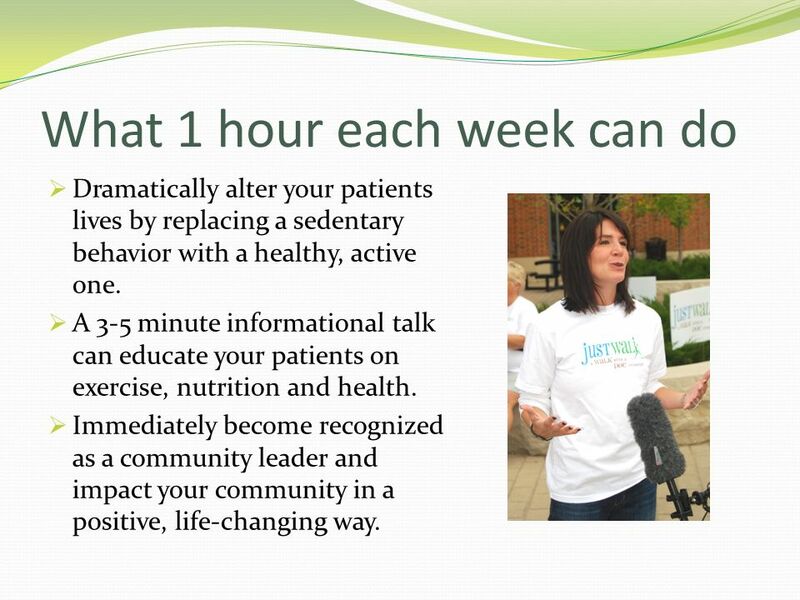 We started this program because it was an opportunity for us to connect with patients and hopefully, for walkers to have the motivation to come out and join us for minutes. 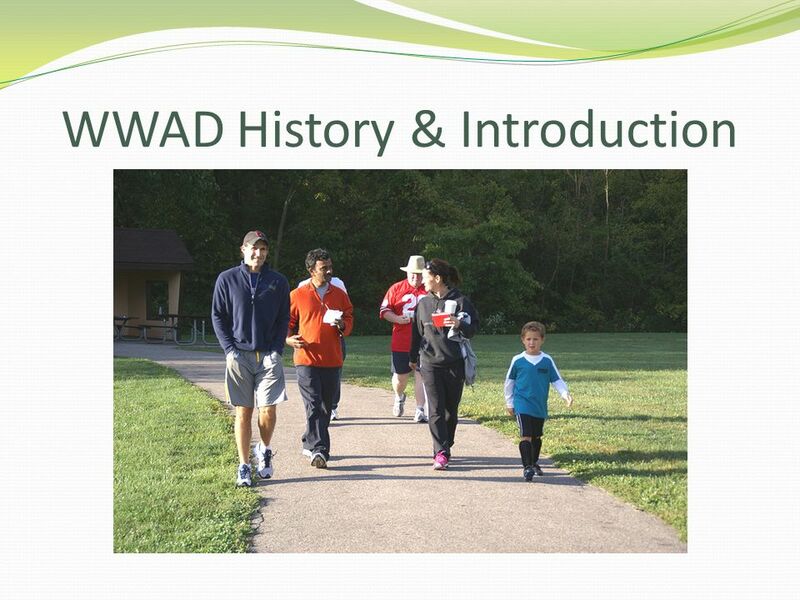 Learning about healthy lifestyle options and connecting with other walkers is an easy and fun way to get or stay fit. 17 Getting Started Get a Doc, a helper… We can help! Find a park… We can help! Get some walkers… We can help! Start with your staff and patients. You will get exponential growth. 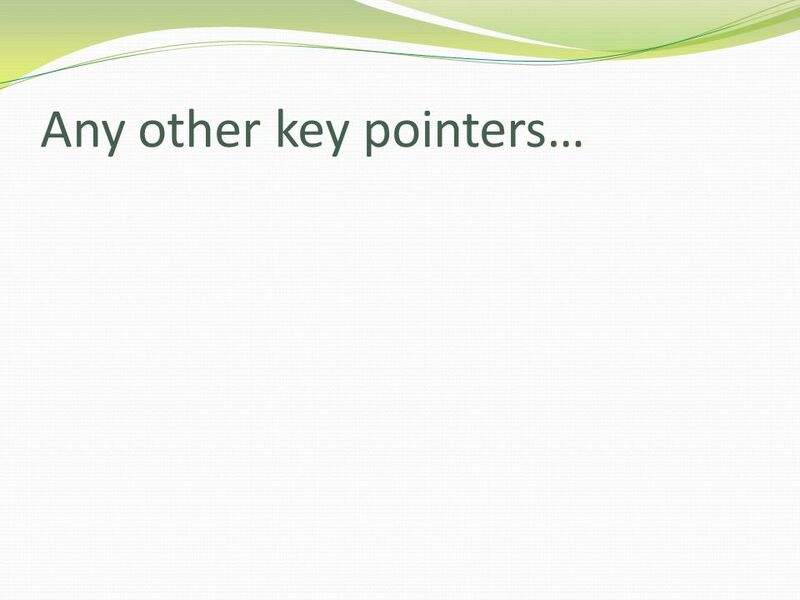 It’s easy to develop a “community”, addresses allow for quick communication within your group. Establish and secure a meeting place and a walking site. Spread the word! It will catch on fast. 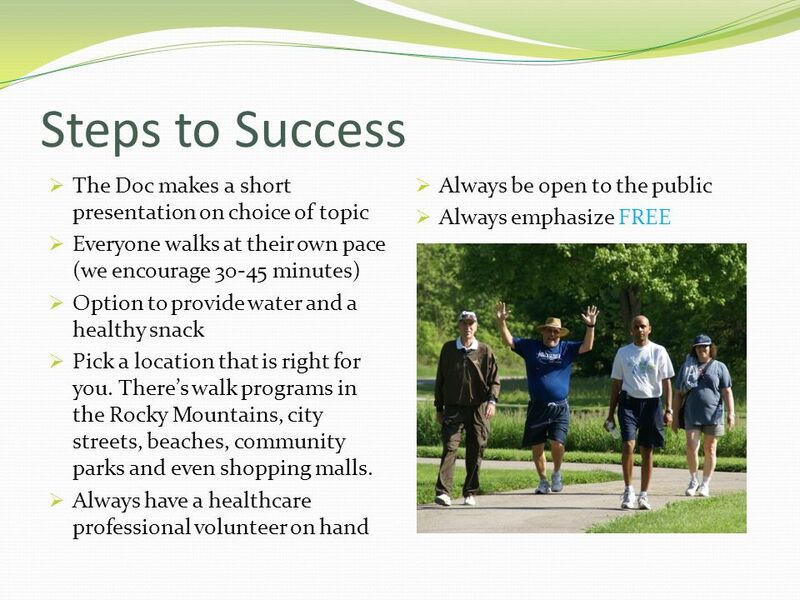 19 “Walking is a simple and effective way to improve your fitness level and health…Walk with a Doc creates a community and support structure for those interested in taking the first step toward improved health. 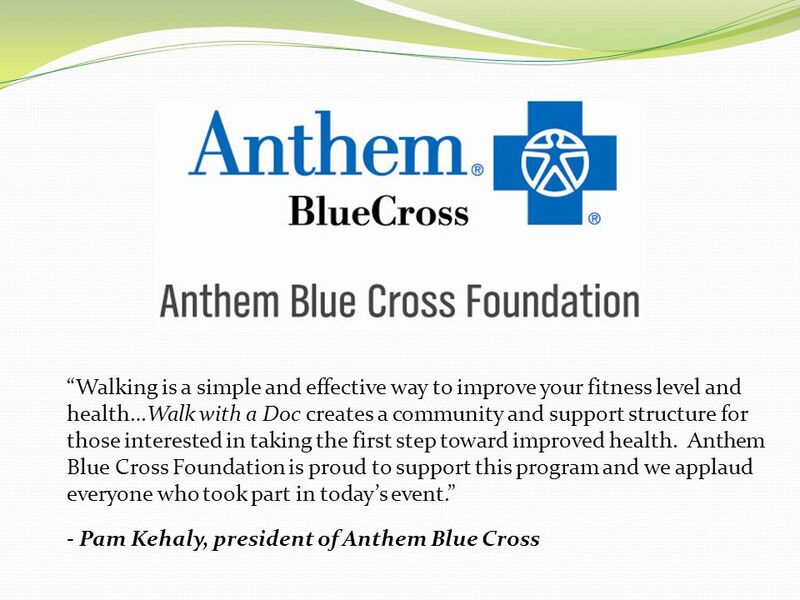 Anthem Blue Cross Foundation is proud to support this program and we applaud everyone who took part in today’s event.” - Pam Kehaly, president of Anthem Blue Cross SANDRA – BEGIN Walk with a Doc is supported in California by a grant from the Anthem Blue Cross Foundation. 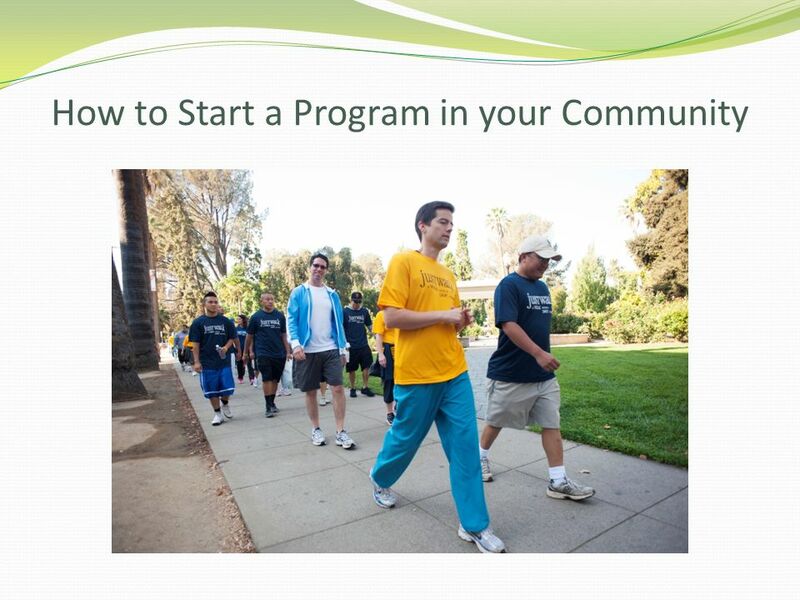 Download ppt "How to Start a Program in Your Community Tuesday, February 26, 2013"
Physicians for Healthy Communities Initiative: An obesity prevention project of the CMA Foundation. Office on Womens Health, U.S. Department of Health and Human Services. PATH Project Promoting Access to Health Alameda County Behavioral Health Care Services Cohort 2, Learning Community Region II Freddie Smith, Project Manager. Carroll County Local Health Improvement Coalition LHIC Annual Conference November 12, 2014. LATINO FACT SHEET The Network for a Healthy California (Network) strives to create innovative partnerships that empower low-income Californians to increase. Presenter Disclosures (1)The following personal financial relationships with commercial interests relevant to this presentation existed during the past. 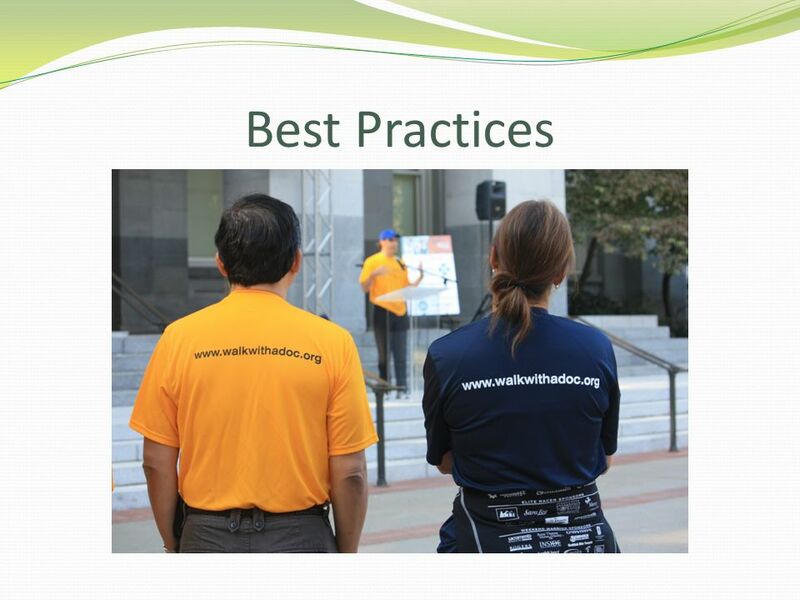 How to start a worksite wellness program Evelyn Escalera & Brandi Muro. The National Symposium on Children’s Wellness, Development & Organized Sports The Center For Kids FIRST In Sports. I CAN Prevent Diabetes! Individuals and Communities Acting Now to Prevent Diabetes Recruitment Discussion 2012. HEALTH: Healthy Early Childhood Activities Lead To Healthy Kids Martha Hiett Health Policy Administrator Division of Child Care and Early Childhood Education. FIT TOGETHER Supporting Independence and helping to prevent and improve long term conditions. Kristin Wiley Parents of obese children. Introduction  Past 3 decades the number of youth obese has tripled  Today, 12.5 million children and adolescents. HEALTHY HABITS FOR TEENS NURS 440 / GROUP 2 DENISE COONEY, KEVIN DOAN SCOTT KOWALEWSKY, & BRANDON ZOLYNSKY. HEALTHY FAMILIES CREATE HEALTHY COMMUNITIES FCS HEALTH PROGRAMMING ACROSS THE COMMONWEALTH Family and Consumer Sciences Extension Advisory Council Meeting.